As always, there's an extra doodle if you vote! 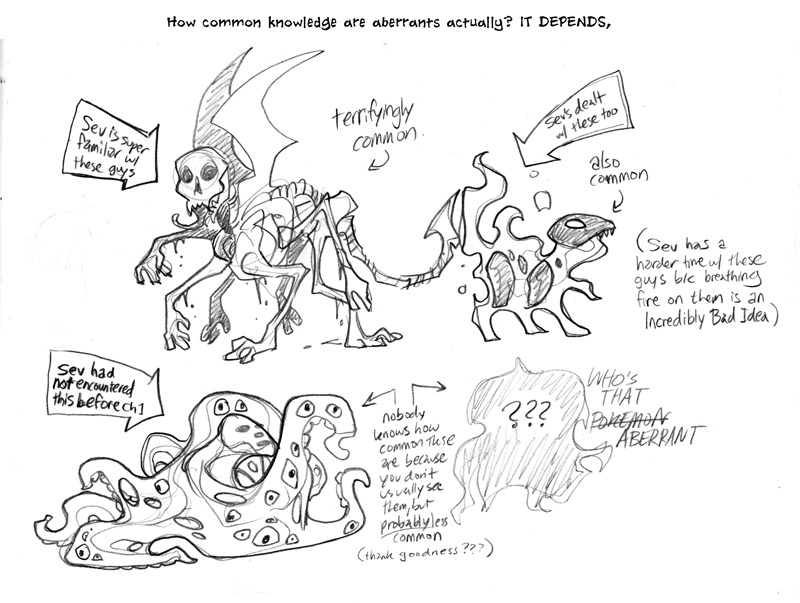 This is a tiny note about aberrants. Also, $5 patrons! 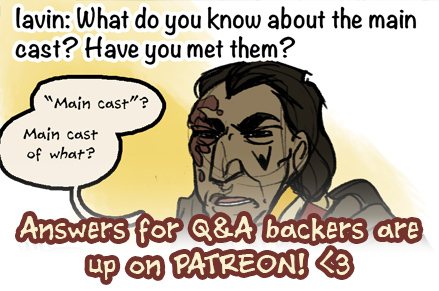 I forgot to link it here but the answers to last month's Q&A went up last week! And there's only a few more days to get your questions in for next month! Way to tell the customers what they're buying before you sell it to them lol, guy. is this ....not what you expect when you buy a room at an inn??? "Oh, and if a screaming portal to Hell opens up in that corner, just hang a coat over it or something." I love how normal these ordinarily horrifying things are in this place. Oh, that axe murderer chasing my other patrons down the hall? Just remember to keep your doors locked. You'll be fine. I can't imagine sleeping in that cube would be comfortable. Then again, does she even sleep? I would so not be down to stay in this place. 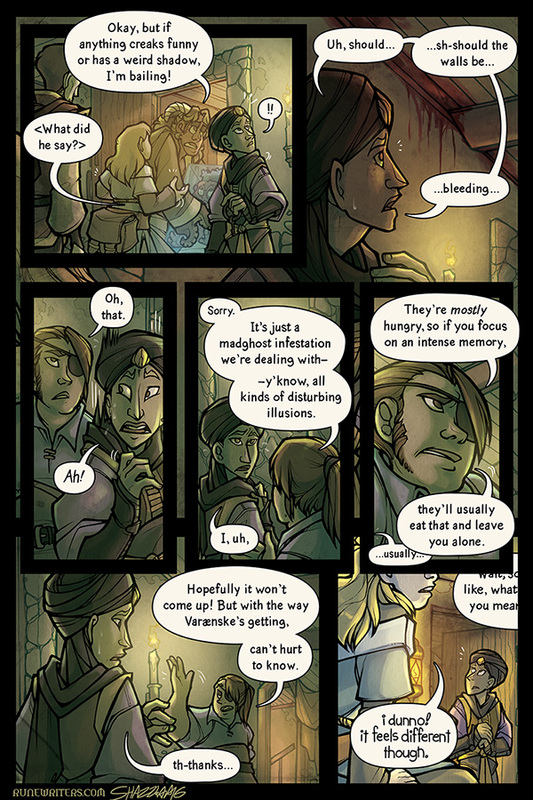 Anyway, the fact that even Sev would rather not stay there is a BIG clue to the spooky factor. The guy just jolly waltzed up to "Teh Evilz Necromeancer" to ask for help and then jumped at a death abomination and eat its heart. So yeah, if Sev is spooked then so am I. WHAT DO YOU MEAN EAT THE MEMORY?! I FEEL LIKE YOU SHOULD BE MORE WORRIED ABOUT THAT THAN YOU ARE. "The way Varænske is getting"? So it's not just runewriters? Is stuff going wrong across the board, or just magical stuff. Some portent of a big magical disaster? Hmmm we know the Agorath order are our 'bad guys', I'm wondering if they're doing bad stuff in response to whatever is happening with magic (Which could be supported by whatever was happening to Quentin's arm a while ago), or if their work is somehow causing it. We also know from the innkeep and the guard that the "Agorath folks" are supposedly here to do something regarding the aberrant problem, for whatever that's worth! So, now I'm presuming that the madghost infestation might also be responsible for the way the inn looked on the outside . . . Amber, could you please tell us what reality is at this time? Honestly, I would believe anything you said and probably feel so much better! I LOVE it when comic book writers do stuff like this. Playing with a medium is just so cool! I just realized why we never see Jonan smiling: All his life, he's heard people saying that you should strike a happy medium. For what it's worth, here's a filler strip (from AWHILE back) with the different aberrants. In, you know, fat animal form. I meant to put this on the most recent page? ?